The Geschlossene Aufbau für Munition auf Anhängerfahrgestell (1-achs) 900 kg (Sd. Ah. 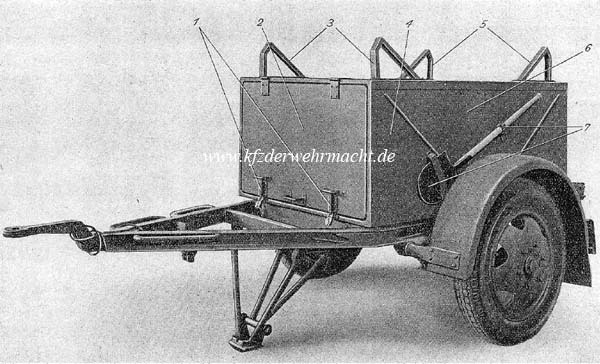 31) – closed superstructure for ammunition on trailer chassis (1-axled) 900 kg (Sd. Ah. 31) – was most probably developed in 1941 and introduced early in 1942. Primarily, it was used for transportation of the 7.5cm ammunition of the Pak 40 and Pak 41. The Geschlossene Aufbau für Munition der 7.5 cm Sturmkanone 40 auf Anhängerfahrgestell (1-achs) 900 kg (Sd. Ah. 31/1) was exclusively used for transportation of the ammunition of the 7.5 cm Sturmkanone 40. 64 rounds without cases could be stored in the Sd. Ah. 31/1 which was identical to the Sd. Ah. 31, outwardly. This image originates from D 691/22 (equipment description and loading plan). According to the loading plan, ammunition of several guns and mortars could be stored in the Sd. Ah. 31. 1: clasps for front hatch, 2: front hatch, 3: stop bracket for front hatch, 4: box, 5: stop bracket for rear hatch & 7: holders for spade.